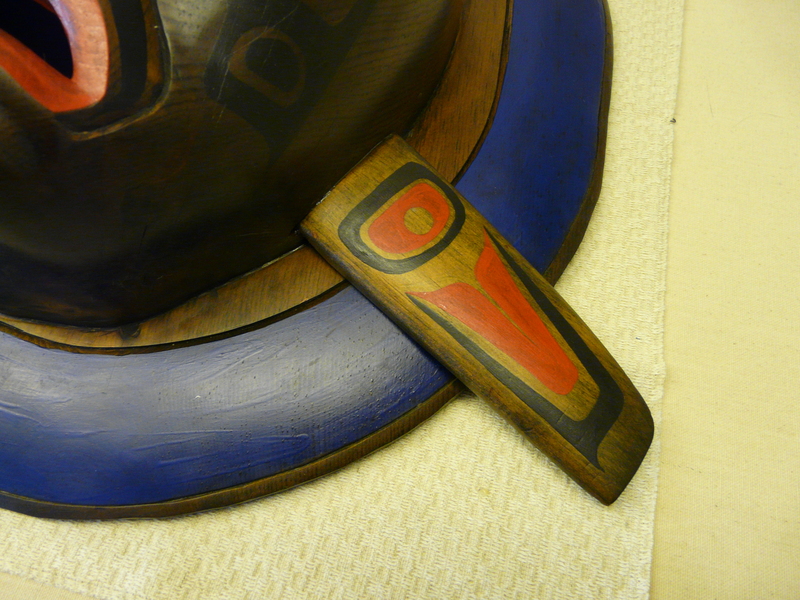 In celebration of National Aboriginal History Month – we share the after treatment photos of a Moon Mask. Carved from yellow cedar, it depicts the head of a killer whale. The mask was carved in 1986, by Tom LaFortune of the Coast Salish Nation. Among his most well-known works are the Totem Poles located in Duncan B.C. The mask was damaged from a fall during installation. The treatment included cleaning surface accretion from the paint and reattaching the damaged ‘fin’. Tom was born in Duncan in 1959 and is of Coast Salish heritage. He is from the Tsawout First Nation of the WSÁNEC (Saanich) peoples. Tom has worked with wood since the age of eleven. He honed his carving skills with master carver Simon Charlie, while working alongside his brothers Doug and Francis. Tom’s work is recognizable by his distinctive choice of colour.